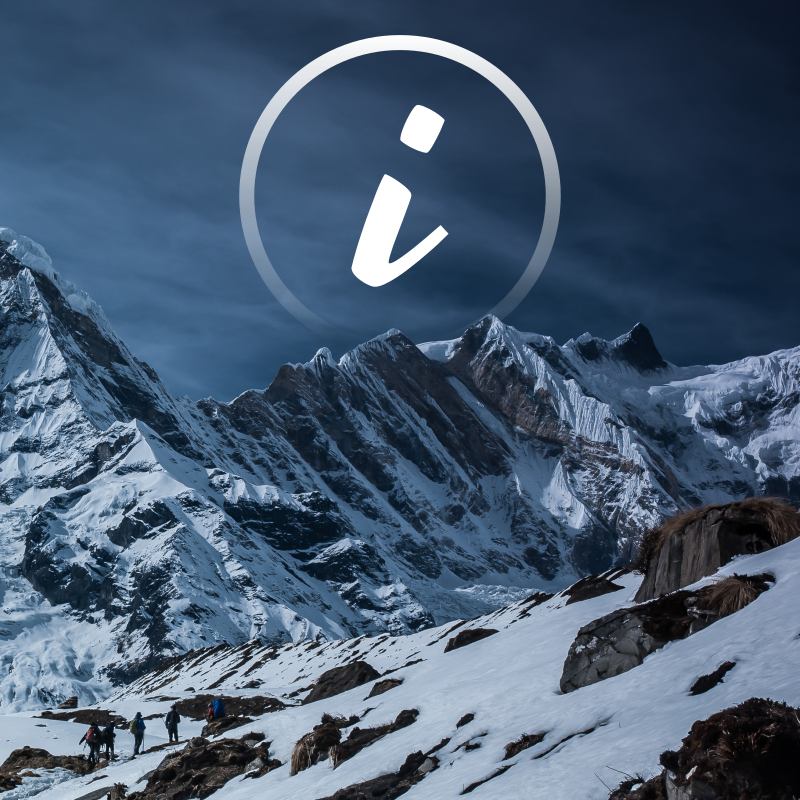 In this page you will find all the assistance needed to rent your ski equipment, or your hardware of snowboarding on the Skimax.com site. To begin your rental, you must choose the type of products you are interested ! Skis, skis and sticks only. Snowboard packs, snowboard and shoes included. Select your model or your pack. 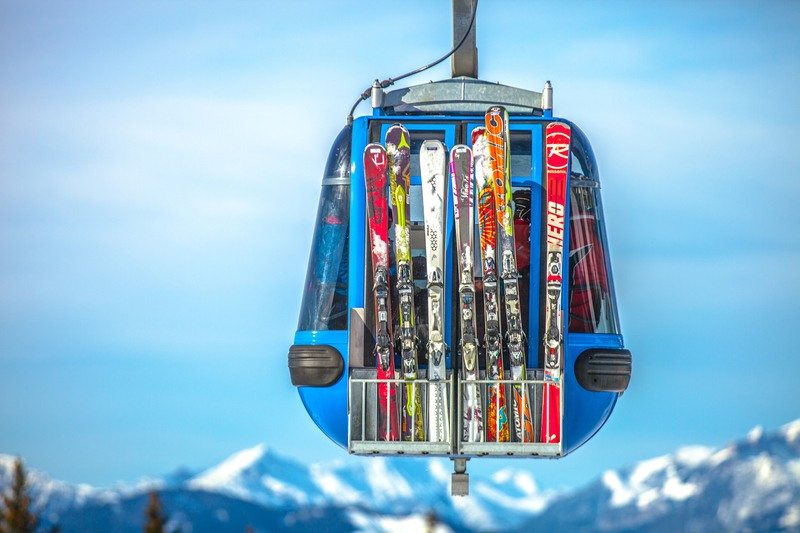 Once you have selected the type of rental you want to perform (a pack or a single equipment) on our site, Skimax.com offers different filters on the left of the page. 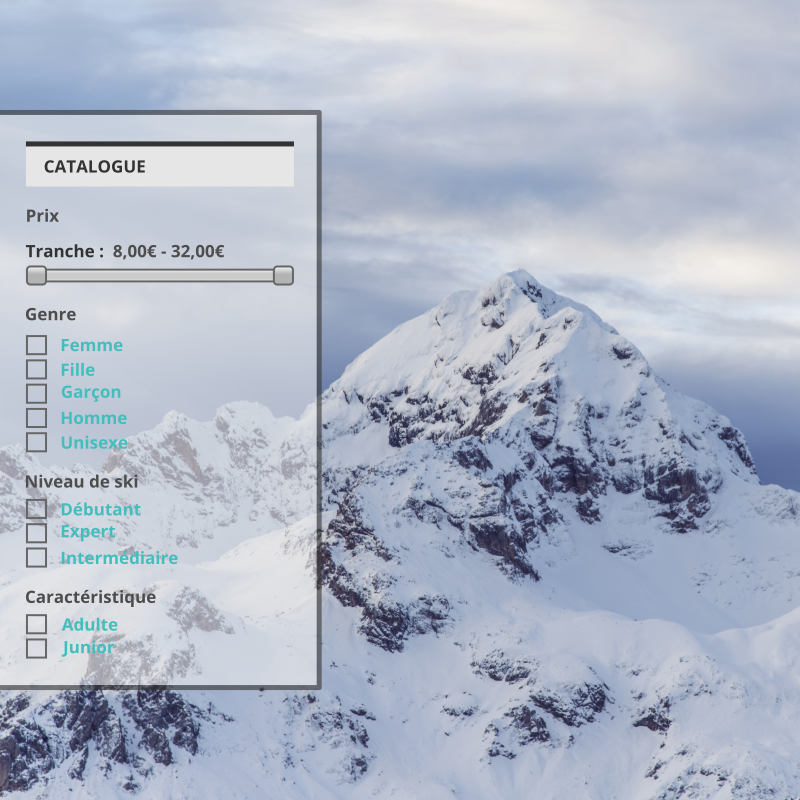 You can sort the rental items based on your budget, your gender (male, female or child) or depending on your level of skiing. Once the sorting is done among our products you can take the next step by clicking on the button CUSTOMIZATION. Once on your equipment card, there are two important information fields to fill in, the CUSTOMIZATION area (below the product sheet) and the ADD TO CART box (on the right of your screen). The CUSTOMIZATION must be filled first, it allows us to know who's going to use this material and to adjust your equipment. The fields "name", "size", "weight" and "date of arrival" are mandatory, once it's fields are completed, click the "SAVE" button. 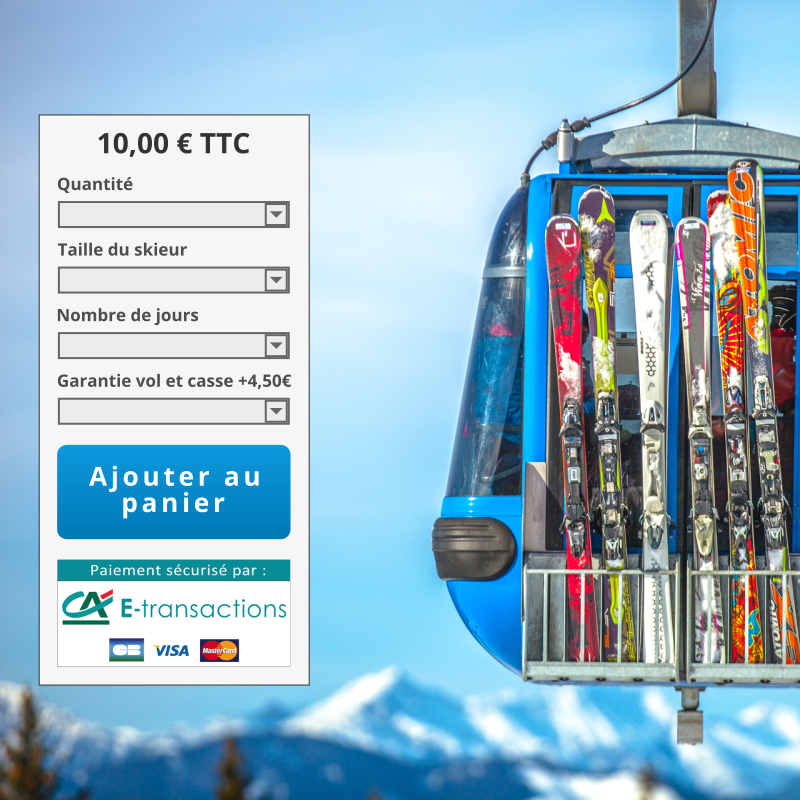 The ADD TO CART area allows us to reserve your skis according to your size, it also allows to know the duration of your hiring and if you wish to subscribe to our insurance "Theft & Cass", which we strongly recommend you. Once this step is completed, click the "ADD TO BASKET" button. Now two options available to you, complete your booking if you are several people to rent equipment by clicking on the 'Continue shopping' button, or switch to your rental payment by clicking on the "Order" button. 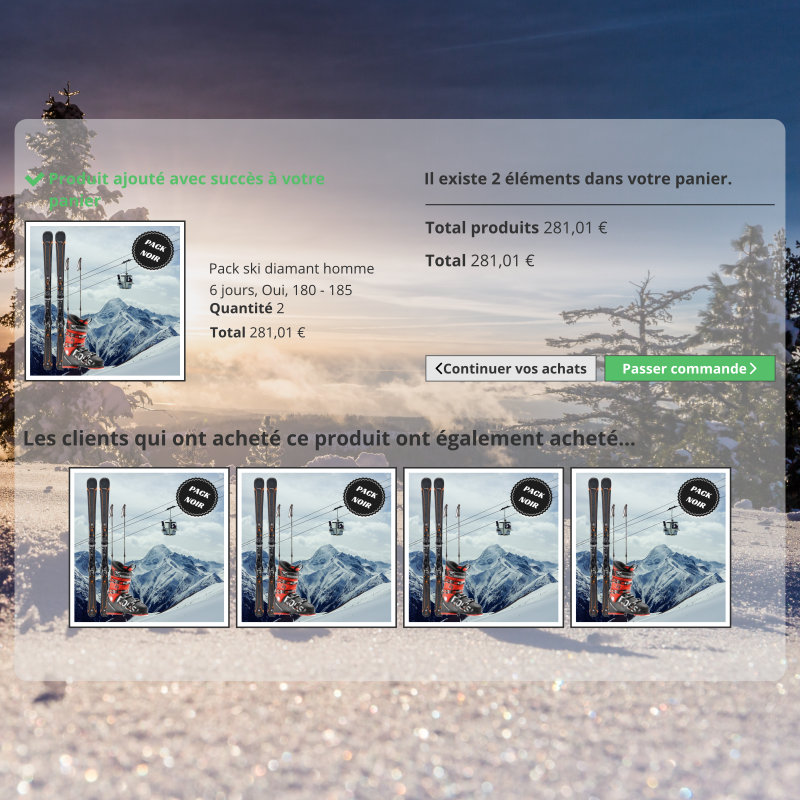 Once you have decided to complete your booking and click the « CONTINUE SHOPPING » button, you return to the previous page. You can choose to book the same product, or to change of ski range, for that simply make your selection from the menu principal ! Where you decide to book the same product, you must again fill the informations of the customization area and the area of the shopping cart. Once my booking is complete, simply click on the "CART" button at the top right of your screen. You arrive on the "ORDER SUMMARY" page, you can remove items by clicking on the trash icon at the right of the product, or complete your order by clicking on the "CONTINUE SHOPPING" button at the bottom left of your screen. 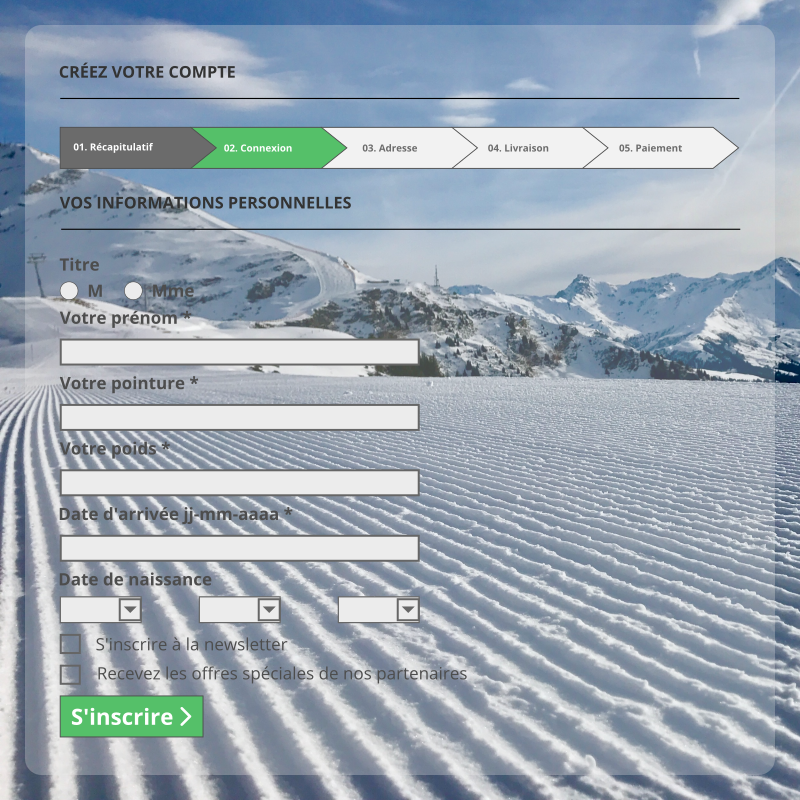 By clicking on the button "ORDER" you arrive on the page that will allow you to create your personal space on Skimax and finalize your order. Once your account is created you can directly access the "Delivery" tab and accept the "GENERAL TERMS OF SALE" then click on the "ORDER" button to move to the next step, the payment of your rental. Pay by bank wire, validation of your rental within 4 days. Pay by check, validation of your rental as soon as your payment has been accepted. Pay with a CB card, immediate validation. Pay with a Visa card, immediate validation. Pay with a Mastercard card, immediate validation. Pay with a e-card blue, immediate validation. 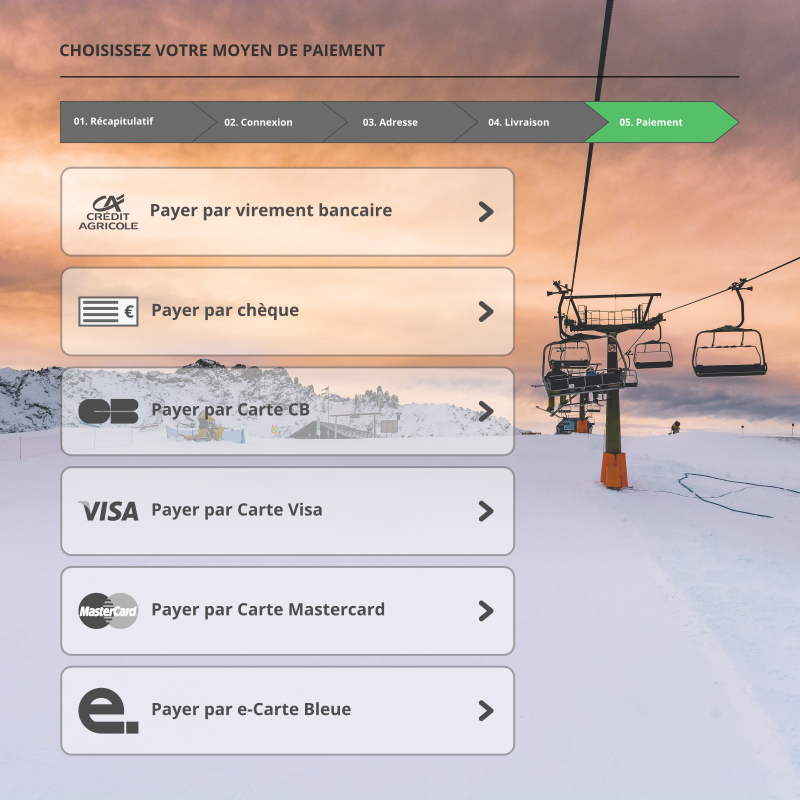 As soon as your payment has been accepted, you will receive an email from Skimax.com that confirms that your reservation has been registered by our services. You can think of from this moment, your skis to await you in store on the date that you have provided to us. Booking problems & Customer Service. In case you encounter any problems or difficulties to book your equipment, contact us directly, we will be happy to help you. Via the Contact form on our site. By telephone +33 06 45 49 65 81.